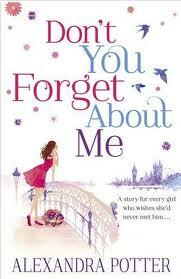 The cover for Don’t you Forget About me has to be one of my favourites so far this year so it was easy for me to decide which book I should read as my 200th book on Goodreads as this continually caught my eye and I have loved previous books by Alexandra Potter. Heartbroken Tess has just been dumped by her boyfriend and all she wants is to get back together again, in a mysterious situation Tess gets her wish to go back and start the relationship from the beginning again and she is determined to do things differently this time to make the relationship work. I thought this was an excellent storyline as I am sure we have all been in the same situation as Tess, broken hearted and would do anything to have a second shot at a relationship so we can relate to her character even though the majority of us do not get a second chance and definitely not one to wipe the slate clean and start from scratch. There is a great amount of humour in this book which I found similar to the humour in Jane Costello’s books. Often when Tess is on a date desperate to make the date more successful this time around but the majority of the time something terrible happens to her and yet although you feel for her you can’t help but laugh! Tess was a likeable character from the first chapter as was her friend and roommate Fiona, and I loved the shocking twist surrounding Fiona later in the story which came out of no-where. This is a fantastic romcom which gives you everything you can possibly want in a book laughter, romance and certainly pulls at the heart strings especially when it comes to Tess’s granddad. I found the book pacey and there seemed to be something constantly happening on each page so it was very hard to put down. Alexandra Potter as come back with a bang ! Thanks for the review, this book has definitely made it onto my to be bought list. It sounds great.